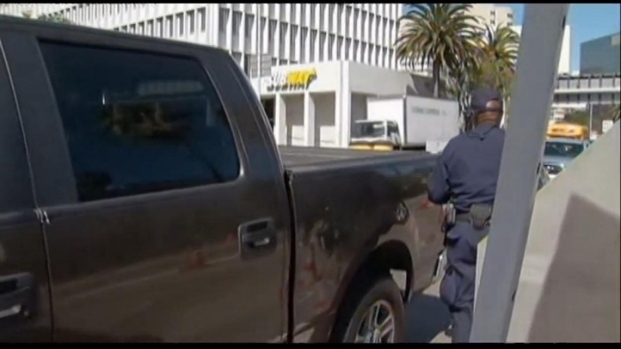 Ten years after 9/11, Los Angeles Police Department security experts have no illusions. "LAX is the number one terror target on the West Coast," said George Centeno, Los Angeles Airport Police Chief. "We've geared up all of our personnel." They don't give out their secrets, of course. But people traveling through LAX this weekend can expect to see extra officers, extra security checks and to take extra time making their journey. "We recognize that the top four threats, as by the Rand Reports, include Improvised Explosive Devices borne in a vehicle," says Centeno. "So, our checkpoints are a part of our strategy." In many ways, what goes on this weekend will be a lot like any other weekend, says Deputy LAPD Chief Michael Downing, who heads the department's counter-terrorism effort. "We’ve done a lot of disruption here in this area," said Downing. "We exploit a lot of intelligence, we work it, we dismantle criminal enterprises, so we disrupt their operational capability. There's some of that the public doesn’t hear about." Police also count on the public to help them keep the city safe. They're hoping that part of the homeland security effort will be on everyone's mind this weekend.